What exactly are Christmas Dreams? Thoughts of sugarplums dancing in our heads? dreams of health, happiness and a soft place to end the day? Being thankful for the gifts we're given. Enjoying home and family appreciating the comforts around us. all that doesn't have to come with a high price tag. Creativity can be the difference. The last few years, I like to bring a little Christmas to the bedroom. to enjoy a room that reflects the love of God's Blessings. But who wants to spend a fortune to have a pleasing style or look? I pull out my old quilt in shades of red to coordinate along with my black toile. all while keeping the toile. For the holiday, I mixed pillows and pattern by using this old Waverly quilt. 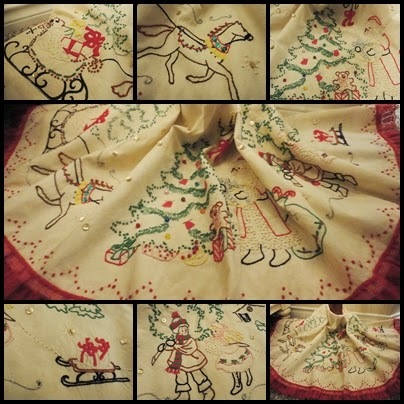 Adding a vintage Christmas pin to a pillow gives it a little something. These hand crocheted vintage pillow cases were designed by my grandmother many years ago. They are still like new and I love enjoying them for Christmas like she meant them to be. white, silver, gold and red. I used over sized pillow shams for cushion covers in the sitting area. or settle in with a good book. The little wood tray holding the teapot and cup is one I hand painted a few years ago. The tree has little red birds, squirrels and owls along with vintage ornaments and snowflakes. many years ago in my 20's. It took me nearly a year to stitch all the scenes adding accents of glittery threads, sequins and beads. I gave her this as a gift before Christmas one year and she used it for the rest of her life. along with candlewicking knots and edged in red lace and lots of love. 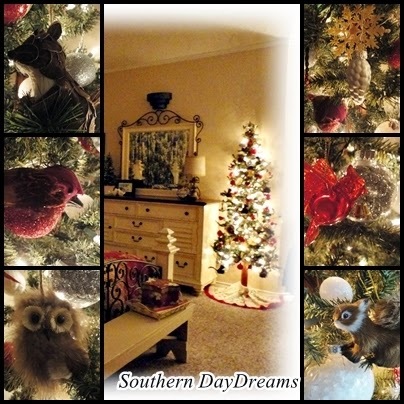 Creative Home Expressions and her etsy shop. I pinned on a red ribbon for the holiday. This is one of my snowmen hand painted a few years ago with a black coat. a place for Christmas Dreams. The only purchase was the stocking from Kathy. I think I can keep the quilt through the winter months. Could you have sweet dreams in a Christmas bedroom? It doesn't take much to make an impact for change. without spending a bunch of dollars!! See you next time with more home decor!